New! 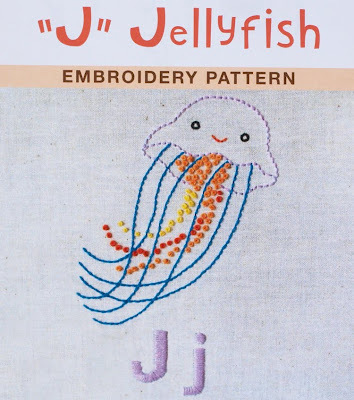 Penguin and Fish Embroidery Kits and Patterns! 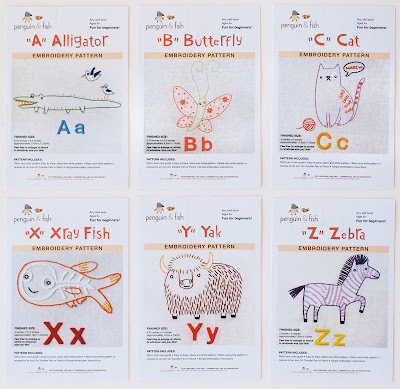 Penguin & Fish embroidery patterns and kits are here! 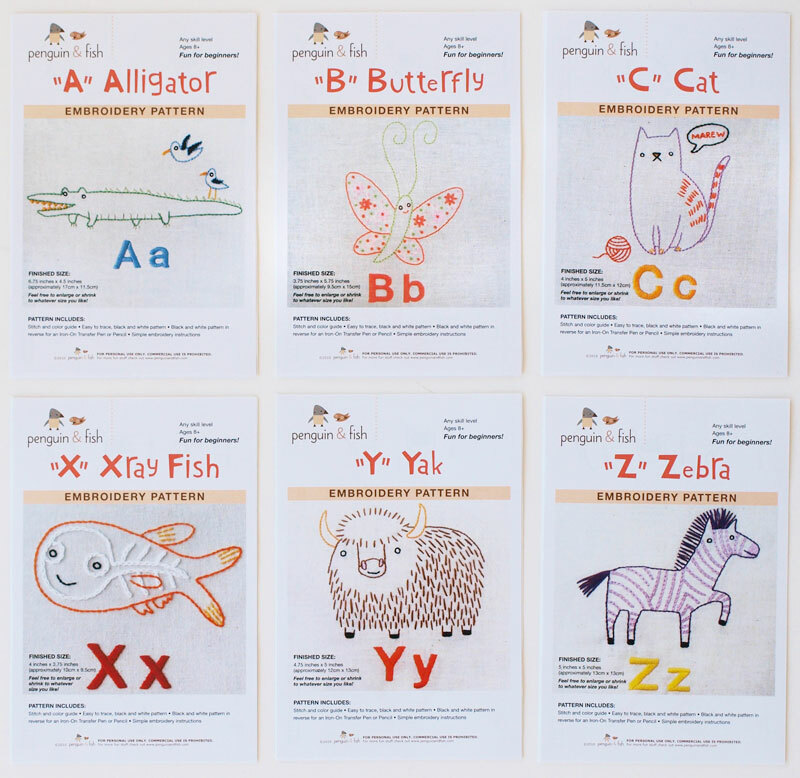 They feature an alphabet's worth of adorable animal friends illustrated be Alyssa Thomas. 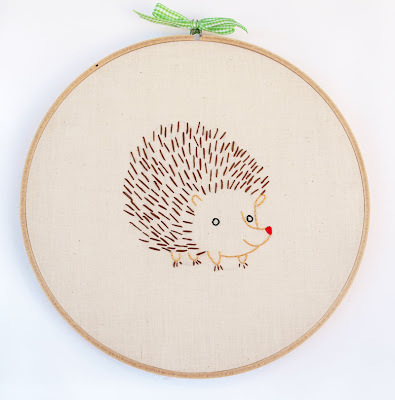 Jaime stitched up the "H" kit in an afternoon and made this hedgehog wall decoration. 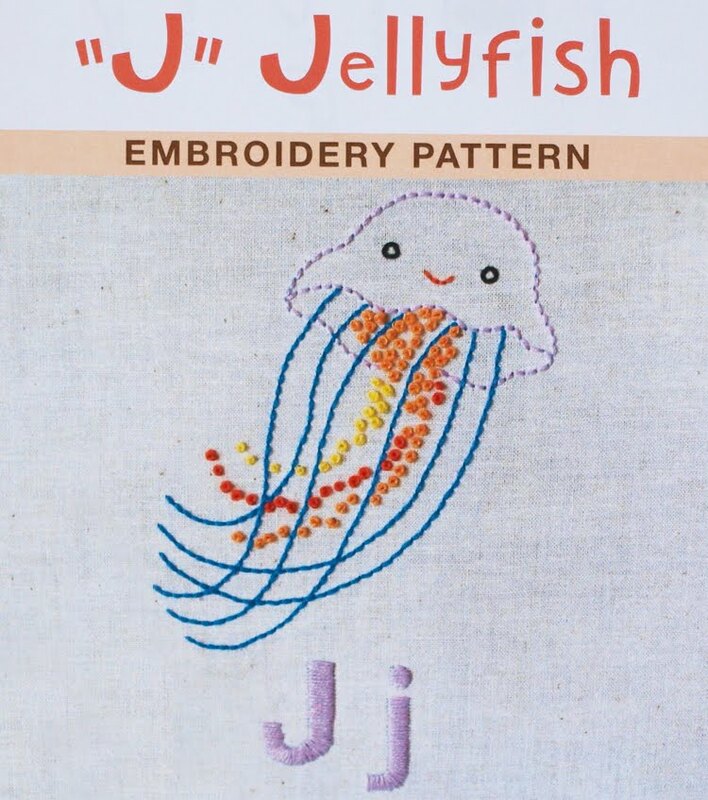 I'm a sucker for jellyfish and French knots, so this little guy is my favorite! Who can resist such a cutie! Alyssa showed off this sweet quilt made with her 26 embroidery patterns at her quilt market booth. We love it! 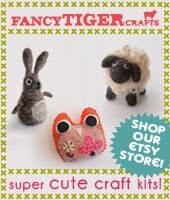 As you know, we all have been a little daybreak crazy over here at Fancy Tiger Crafts. Here is some of the awesomeness that we have been creating! All of these daybreaks were made using the fabulous pattern by Stephen West and various sock yarns. Zach was the first daybreaker that started this whole thing when he made his Daybreak-of-Love. Danielle made us all jealous with her gorgeous combination of creamy Malabrigo sock yarn mixed with Noro sock yarn - pretty! Amber is really into rainbows and it shows in her daybreak made with a rainbow Zauberball and citrus-y green alpaca sock yarn. 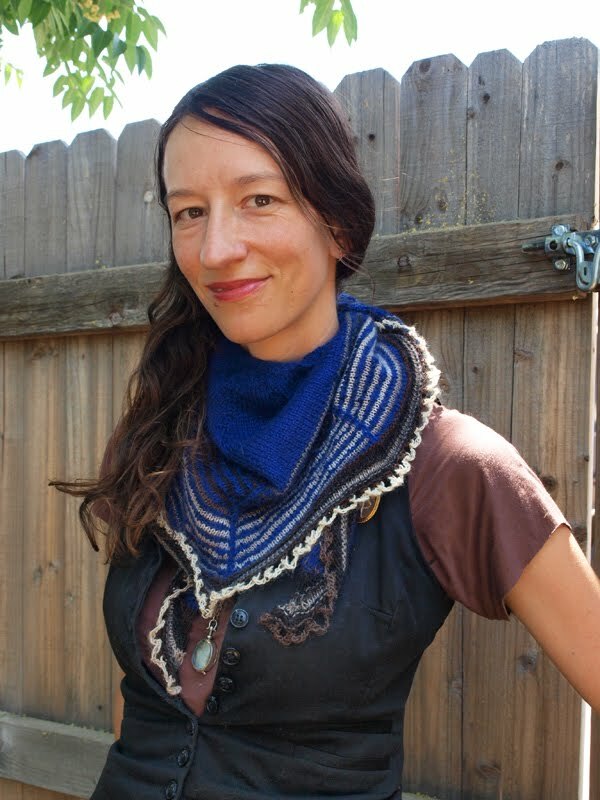 Emily used the luscious and vibrant blue Wagtail mohair yarn mixed with a neutral Zauberball. 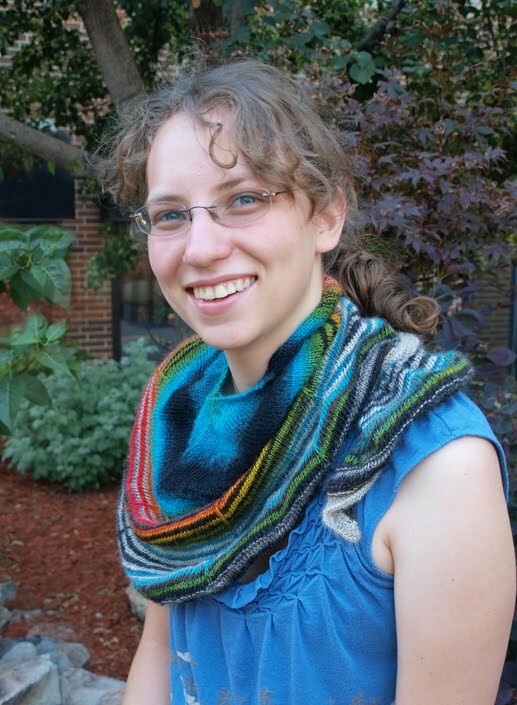 We love the crochet loop bind off she used! Sophia really impressed us by mixing two Zauberballs! 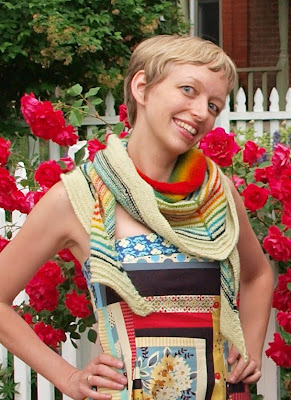 She used a rainbow-striping and a neutral-striping Zauberball for unpredictable non-stop striping action. 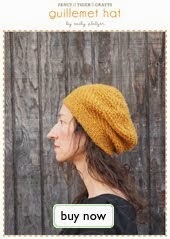 Jaime used the naturally dyed sock yarn from Pico Accuardi that is dyed with her favorite Stumptown coffee. 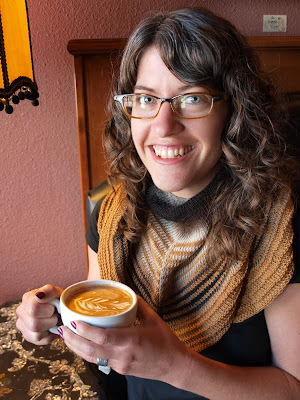 She mixed this delicious yarn (it really does smell like coffee) with a neutral Zauberball for the perfect latte-inspired daybreak. Jess is the only non-Zauberball-using daybreaker and made hers with two colors of Malabrigo sock yarn in Turner and Light of Love. It is oh-so-soft! Krista, that's not a Daybreak! But it is another amazing pattern we have here by Stephen West called the Little Colonnade. 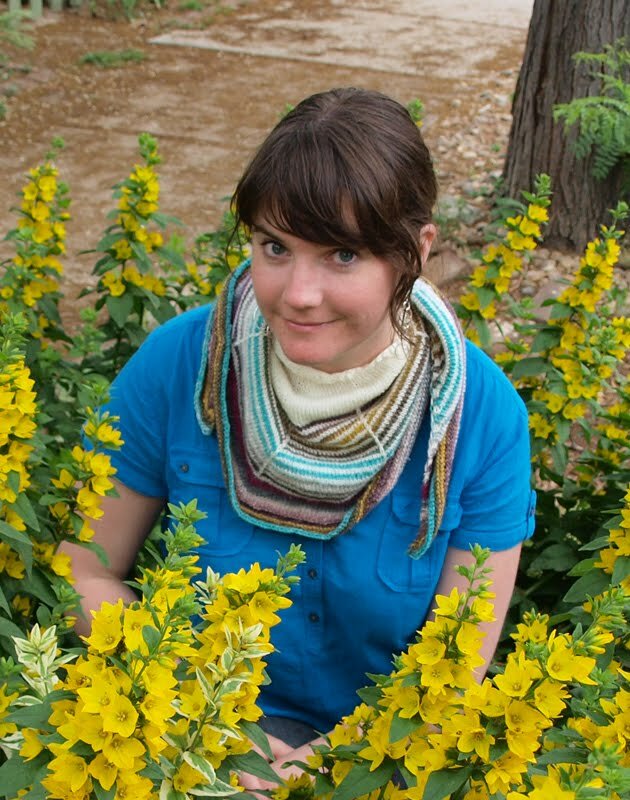 This little shawl-let uses only one yarn color and is done here in the "Neon Bible" colorway of Pico Acccuardi yarn. We all love our shawls! 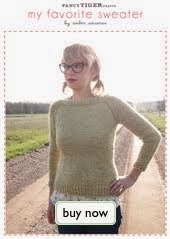 They are fast and fun summer knitting projects and the perfect thing to bring along on a cool summer evening! Glenda and Hazel stopped in recently and made us all swoon for Hazel's adorable new Oliver + S dress. Crafty momma Glenda sewed it out of an Echino border print. Such a cute way to use this fabric! She even made matching bloomers from a purple Echino polka dot! They are killing us with their cuteness! I am a trauma and general surgeon. I'm inspired by other beginning crafters! 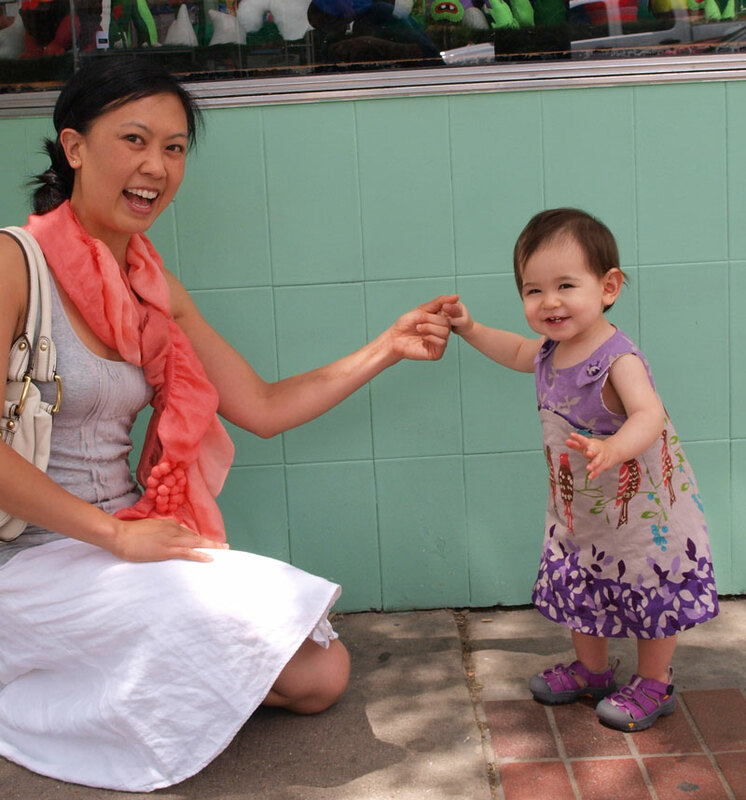 How did you make Hazel's cute dress? The pattern I used is Oliver + S Tea Party Sundress and Bloomers. I made it with Echino fabric. I am self-taught. This is my first time using a pattern. Thanks Glenda and Hazel! Happy sewing! New Nani Iro Fabrics by Naomi Ito! I am in love! 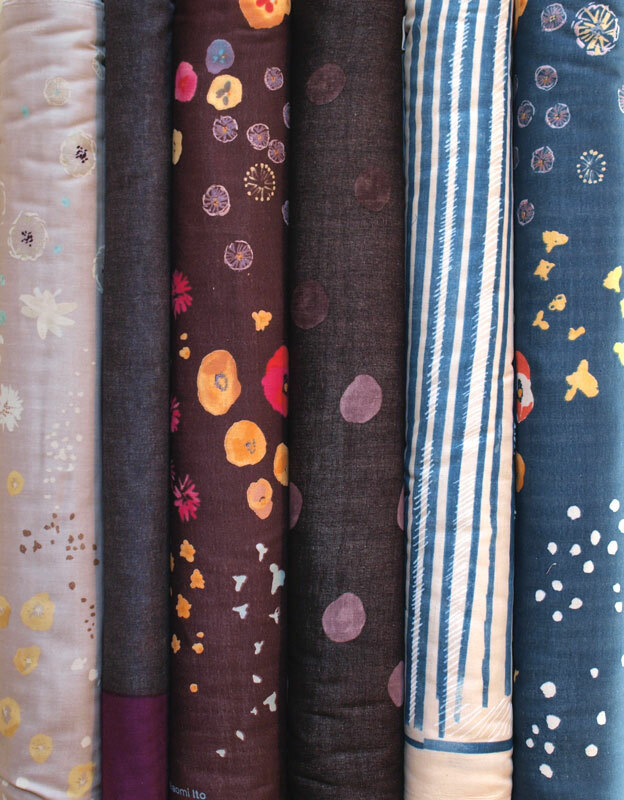 New Nani Iro fabrics are here as of today and I can't handle how hot they are. I'm getting a tummy ache because I so badly want to eat them up, they are so pretty! I want them all for myself, but to give you a fair chance I'm letting you know they are here and they may not last long. 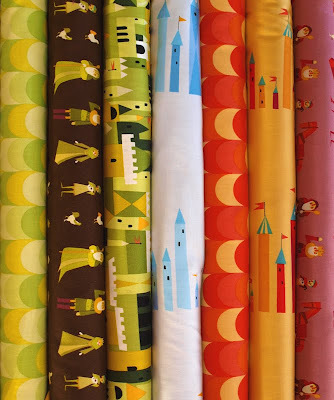 I want to make everything ever forever out of these fabrics! Thank you for letting me freak out like that. Fancyporters Emily and Cat visited the 2010 Estes Park Wool Fest this year to check out the cute and woolly madness. And they did not come home empty handed--we are happy to welcome Queen Victoria, baby English angora rabbit, to team Fancy Tiger Crafts! Shop dog Branwyn is excited about sharing her customer greeting and cuddle receiving duties with Queen Victoria when her new sister gets a little older. For more on the Wool Festival fun here is Cat and Emily! Hello! In spite of the cold, rain and mud, Emily and I had a great time at the Estes Park Wool Fest. We fell in love with the angora bunnies, especially Queen Victoria (little lady on the left above), but there were so many other super cute creatures to look at as well! This cashmere goat loved the camera! And how adorable is the girl in her green knitted cap? Lambs and llamas and goats, oh my! 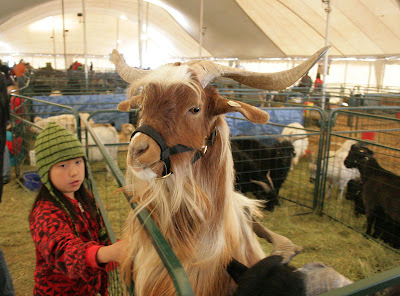 Here are just some of the animals we met at the festival. The Southdown Babydoll lamb's face (top left below) was just like velvet. Her wool was thick and heavy with lanolin. We're considering getting Amber one for her next birthday...their insanely cute smiley faces make Southdowns sheep her favorite! Daybreak alert! 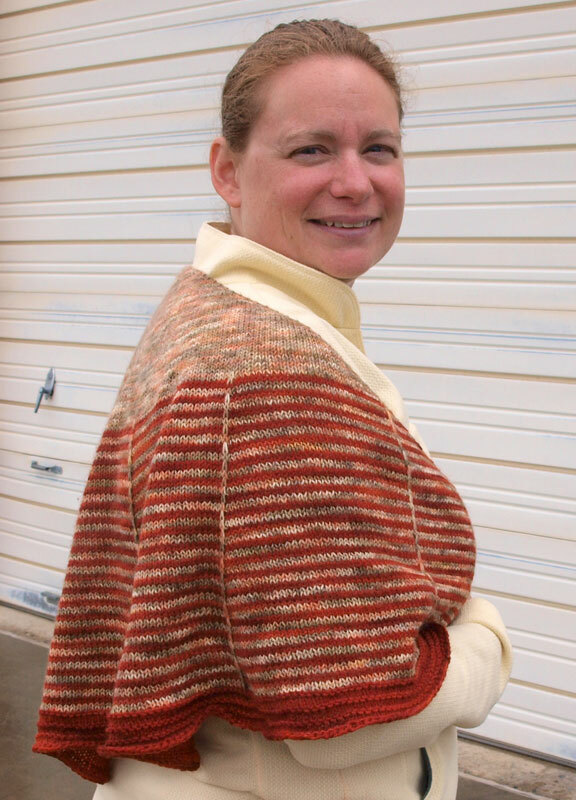 We saw several folks sporting their Daybreak shawls, one of our favorite knitting patterns by Stephen West. This lovely lady stopped to pose for us in the rain. 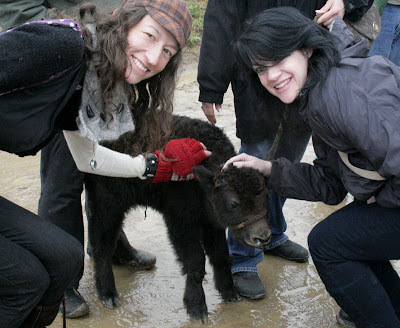 In addition to the sheep, goats, llamas and bunnies there were also yaks. This little guy was just five days-old. His family is starting to bottle feed him to keep him really sweet and tame. What a cutie! Hey guys, Emily here! The picture below is Queen Victoria--taken at the exact moment that Cat and I realized that we were in love. 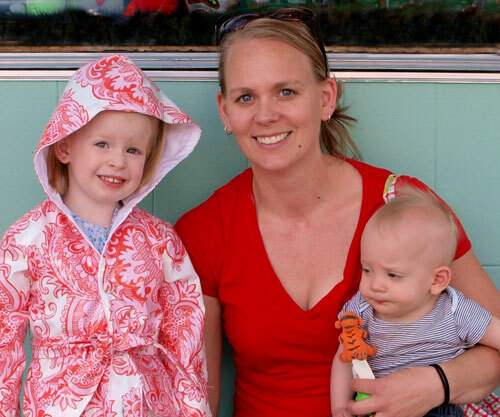 We tried so hard to resist the gravitational pull of Victoria's cuteness! We actually left the festival, went to get coffee, and realized in a panic that we had to go back and bring home our little queen. 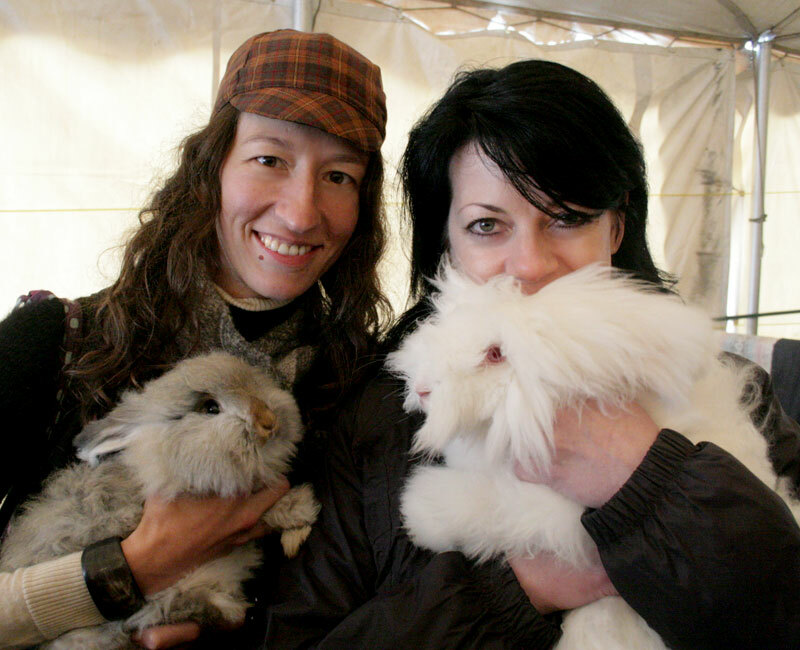 She is from Backyard Rabbit Burrows where Cassi Swanson breeds angora rabbits, the most magical of little fiber animals. 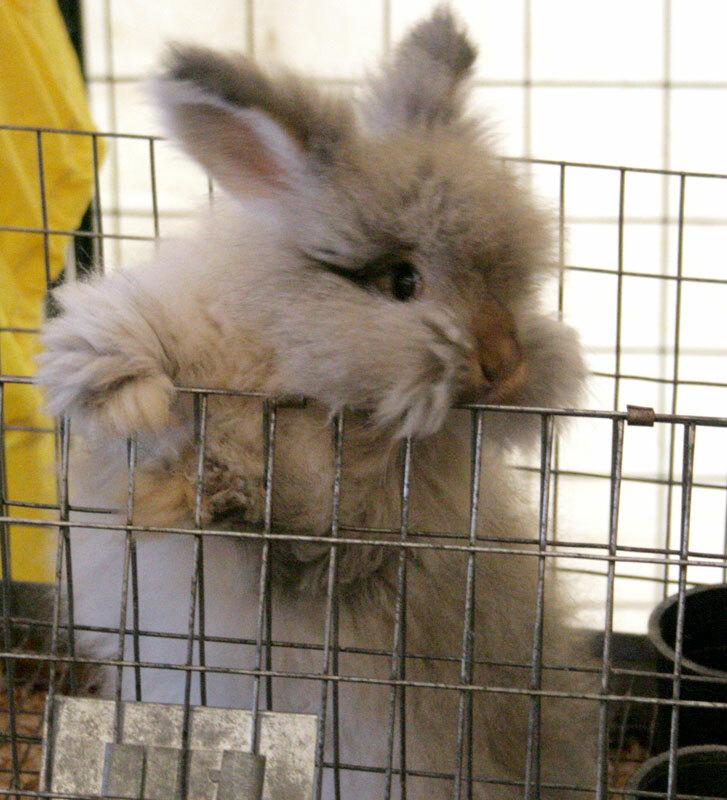 Soon we will go visit Backyard Rabbit Burrows. Cassie has a new batch of baby bunnies and Victoria has dreams of finding her Albert. We'll keep you posted when that happens! Thanks Cat and Emily! And, thanks, cute woolly fiber animals that came out to Estes Park! 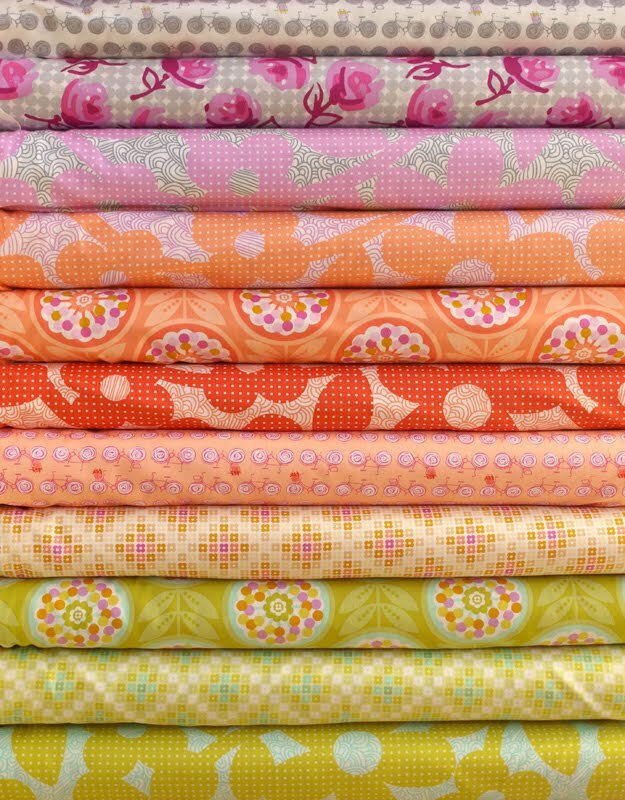 Tons of New Summer Fabrics! 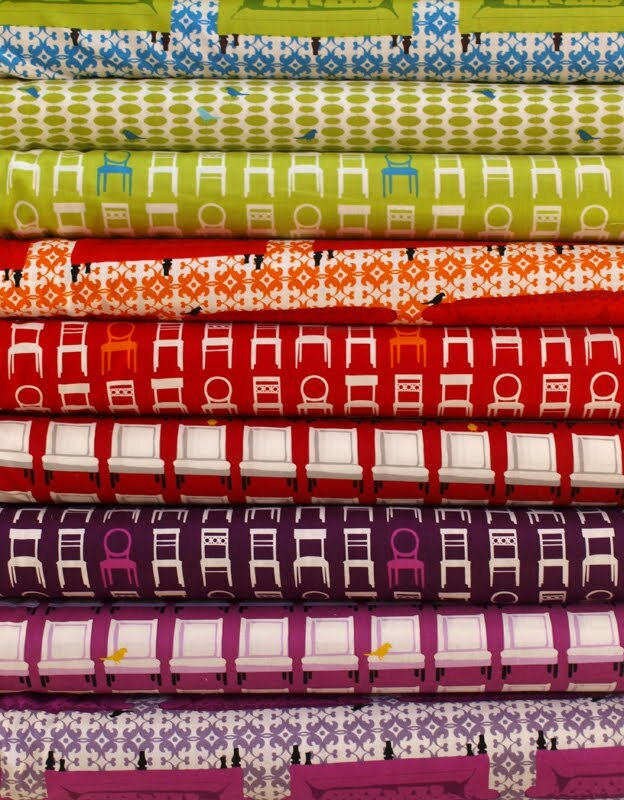 It seems like there is a hot new fabric collection coming out every day! 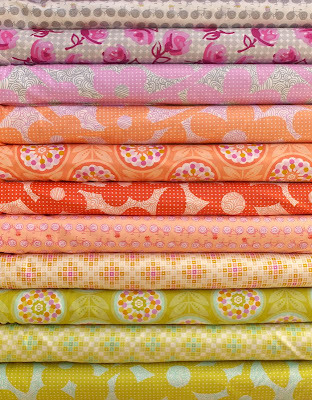 We can't even keep up with all the project ideas we have for all these sweet and summery fabrics. 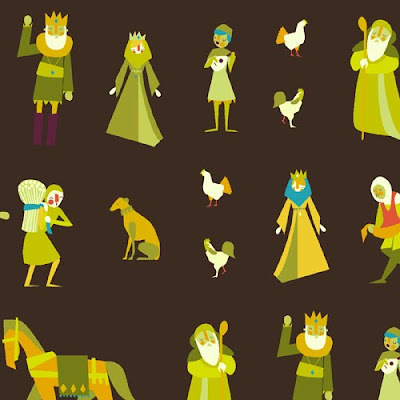 Lizzy House's Castle Peeps are all your medieval dreams come true. We love Lizzy's block print style illustrations! Erin McMorris Weekends is bright and pretty and has cute bicycles! 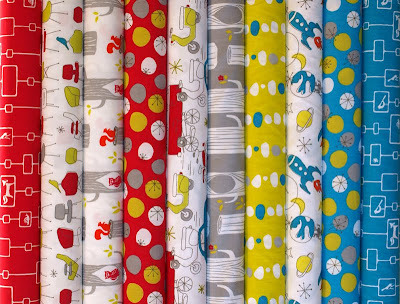 Jennifer Paganelli's Poodle collection mixes bold geometrics with pretty botanicals. 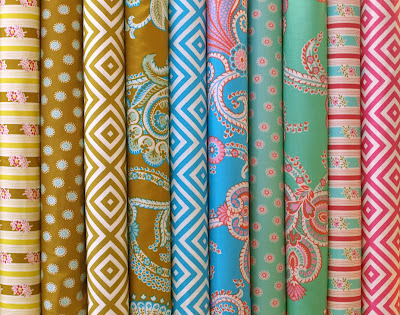 Tufted Tweets by Laurie Wisbrun is bright and modern--I love the crisp furniture silhouettes and the damask backgrounds. 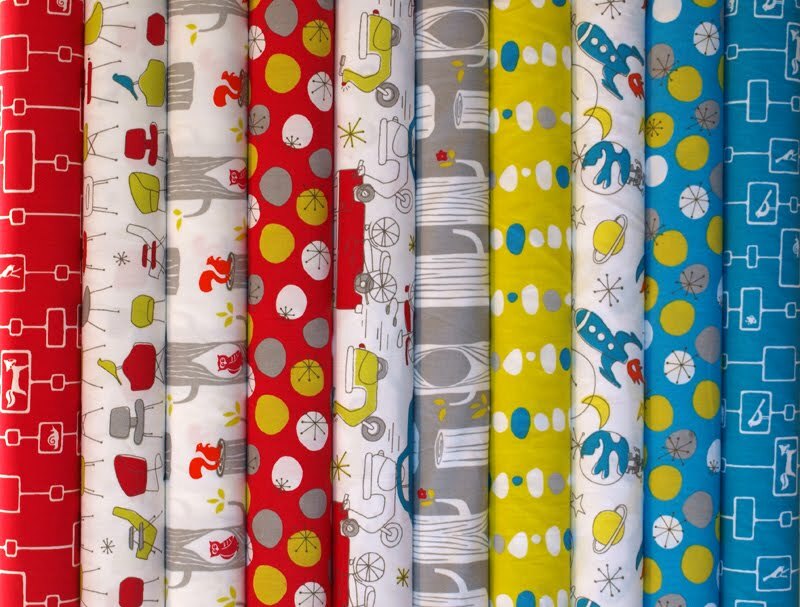 Check out Ashley's (of Film in the Fridge) finished Tufted Tweets quilt to get totally inspired! 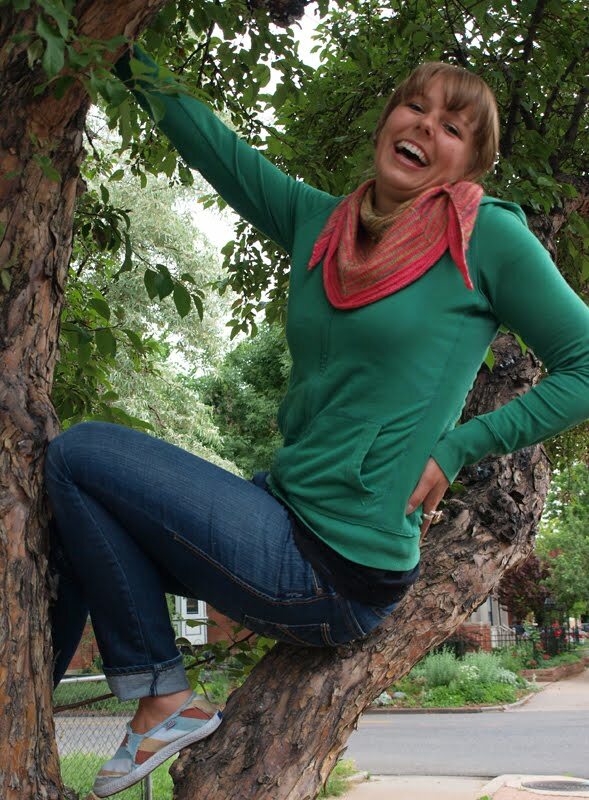 Birch is a new fabric company who specializes in 100% organic cotton and earth friendly dyes. We love their newest line, Circa 50. Who could ask for more than cute owls in trees, scooters, squirrels and birds on mid century chairs? 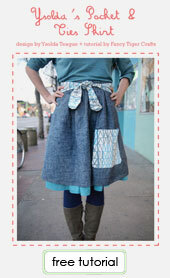 We are always excited when people come in with finished projects in brand new fabrics. 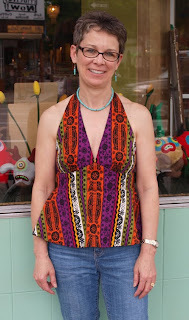 Leslie visited us wearing a mesmerizing halter top she made from Robert Kaufman's Viva fabric, which just came out recently. Nice work, Leslie! I work a lot...so I need to have a fun release. In addition to sewing I'm a woodworker. Tell us about your top. It's a halter top for my upcoming trip to Belize. This was made using a Vogue pattern with some extra touches to place the "medallions". My mom was a professional seamstress and I started sewing when I was 5 years old. 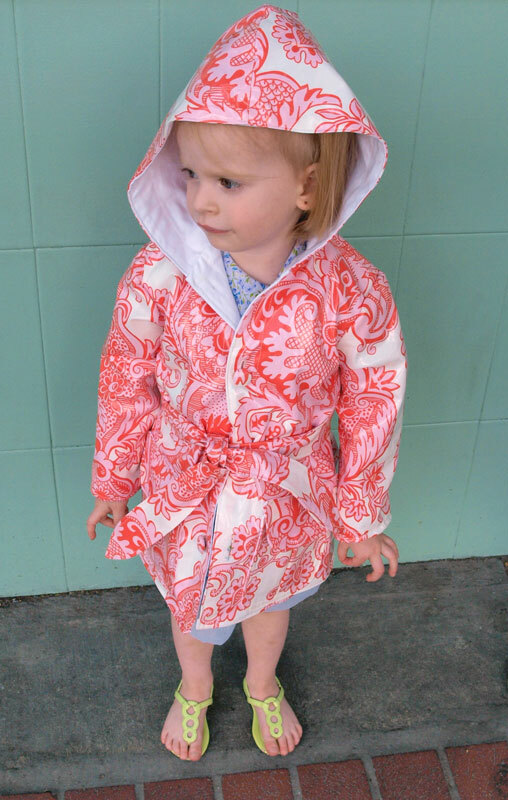 Crafty momma Carrie and her adorable little Ruby came by the shop yesterday to show off Ruby's fantastic new Little Splashes raincoat. Congratulations to Carrie for winning our stitchin' challenge and being the first to bring in her finished Amy Butler raincoat! Ruby was pretty excited about her new coat. She picked out the fabric herself and can't wait for some rain to try it out in. Thanks for bringing it in to show us, ladies! 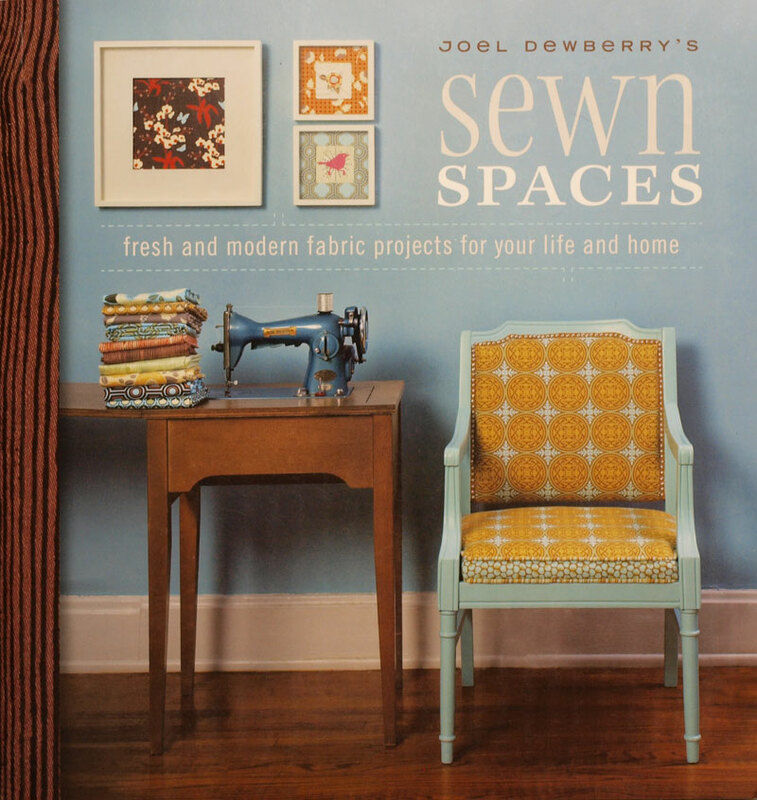 We have been eagerly anticipating Joel Dewberry's new book, Sewn Spaces. 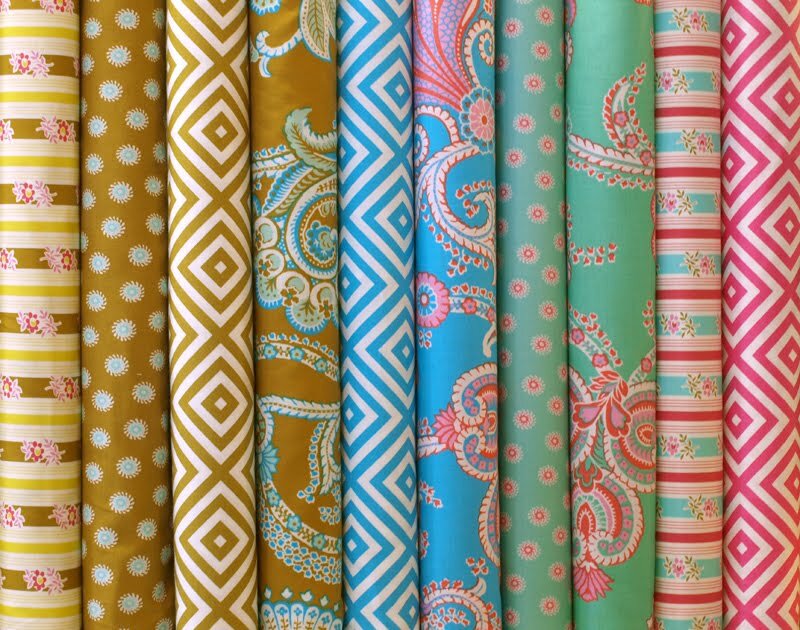 We love his fabric collections--they are always inspiring with their botanical, geometric modern prints. 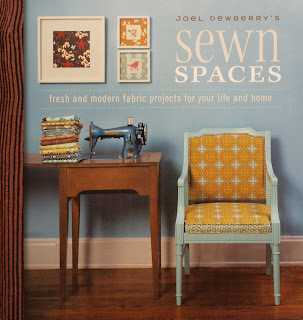 Stylish sewing, applique, embroidery, fabric stenciling and even glass etching are represented in this awesome book! 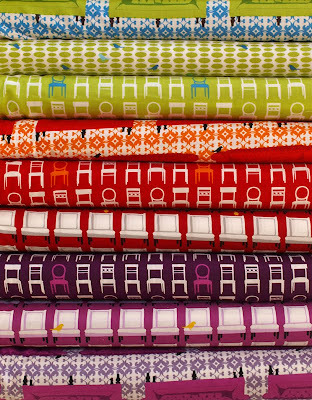 Projects range from bed pillowcases that are easy enough for beginner seamsters to more advanced projects like upholstery. Joel also included a pajama pattern so you'll look stylish lounging around on all your fancy new sewn home decor! 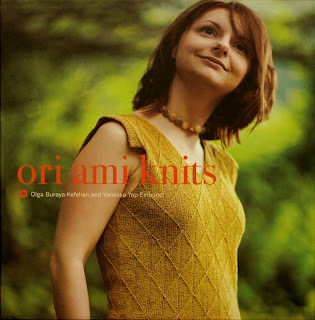 Ori Ami Knits is a celebration of Habu Textiles yarns. The knitting patterns make use of some of Habu's interesting and textural yarns, such as silk wrapped stainless steel, paper yarns, silk tweeds, wool/stainless steel and more. 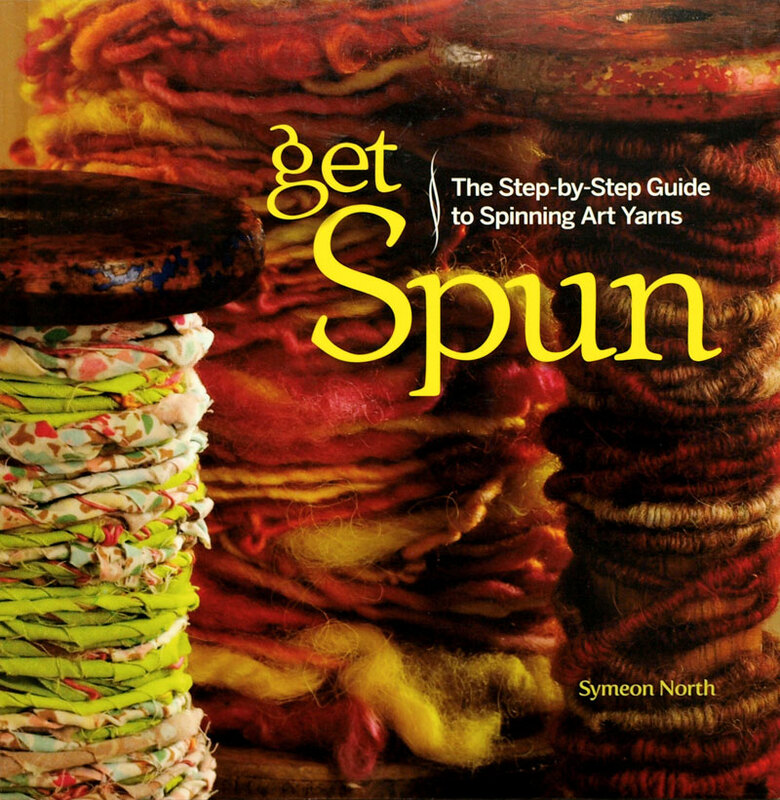 A new book for handspinners, Get Spun, is a great all around guide for spinning unique art yarns. 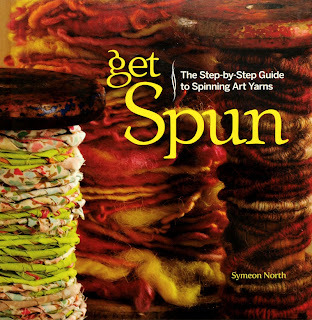 It is super informative, covering everything from knowing your tools--spinning wheel, drum carder, etc--to what to spin--sure, wool and mohair will be cool, but how about adding plastic bags and hex nuts--to dyeing and plying and more! 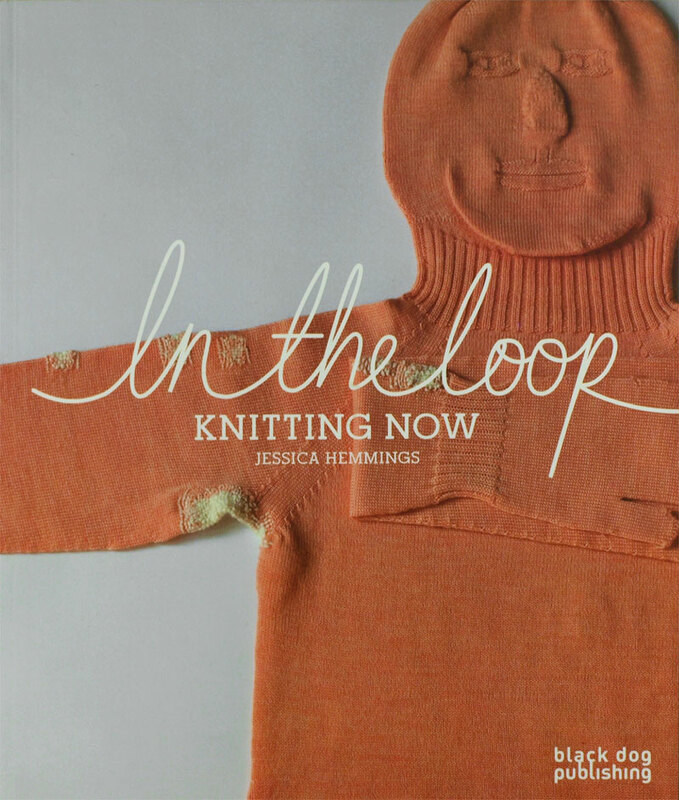 In the Loop: Knitting Now examines contemporary knitting--as art, activism and narrative. 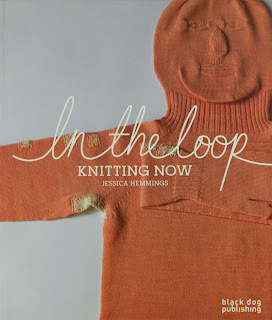 If you want knitting to blow your mind this is the book for you. 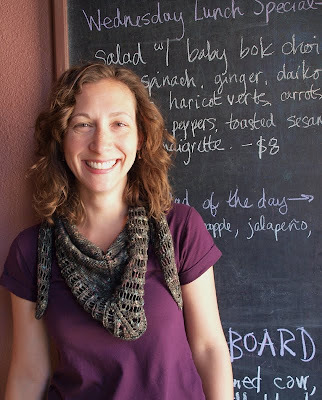 Included are knitted full bodysuits, deep fried sweaters, knitted human hair and razor wire knitted cozies. Weird and awesome. Sophie arrived for one of our teen classes and blew us away with a totally awesome dress she created. The fabric is what really makes it amazing. 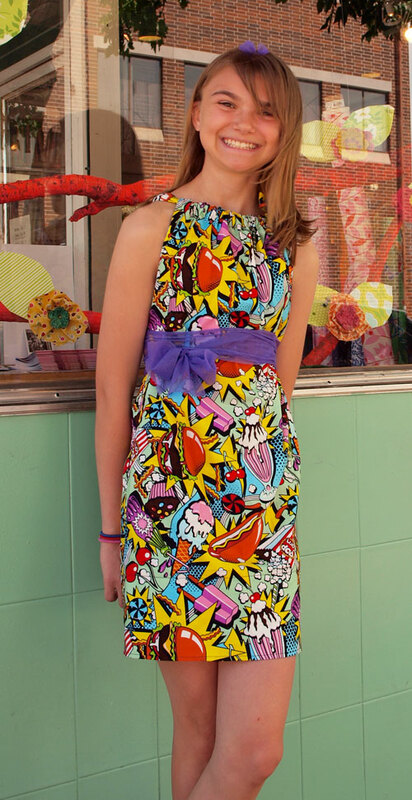 She chose Midnight Snack by Alexander Henry--a fantastically bright pop art junk food explosion! We love it! 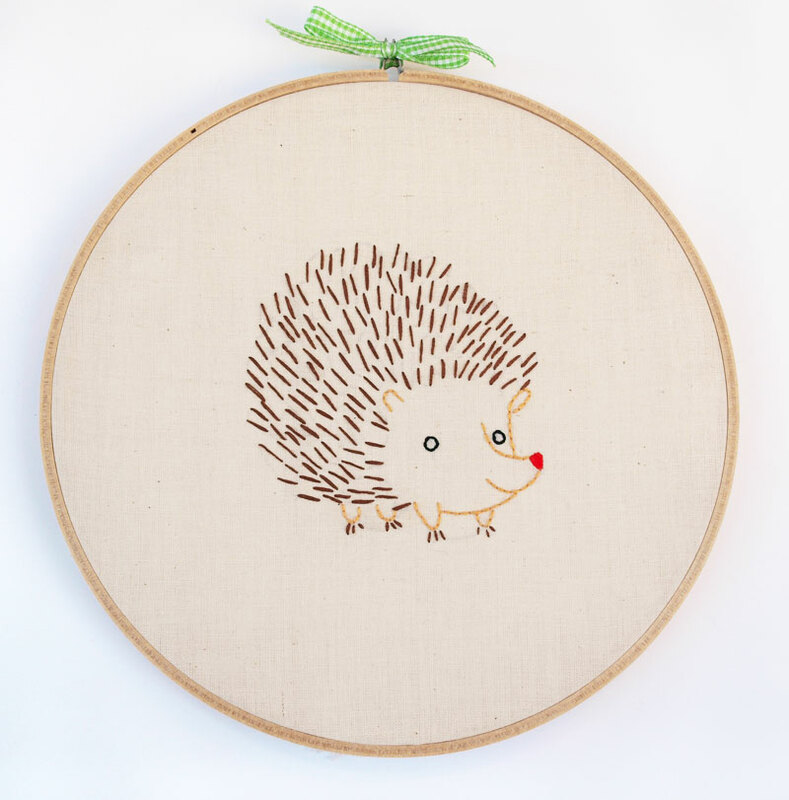 Tell us about yourself and what you enjoy about crafting. I'm 12 years old and in middle school. I like being crafty because it makes you unique! Nobody else will have the same exact thing if you made it. I made a simple summer dress! It took less than an afternoon to make and was very fun. I used about 1-1/2 yards of fabric and some ribbon. My mom showed me how to make my first dress about 2 years ago. 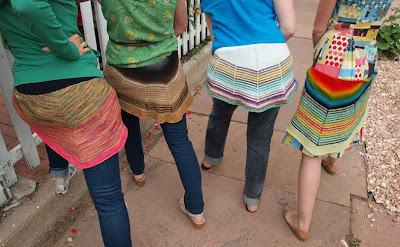 My mom is very crafty and makes her own patterns. 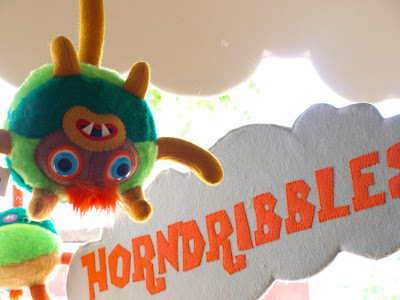 The adorable Horndribbles plushies are here again! 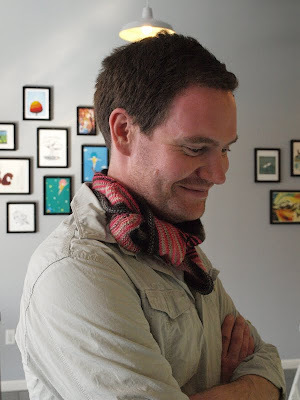 Local crafty artist Lucas Richards has filled the Fancy Tiger Crafts windows with his woolly one-of-a kind monsters. 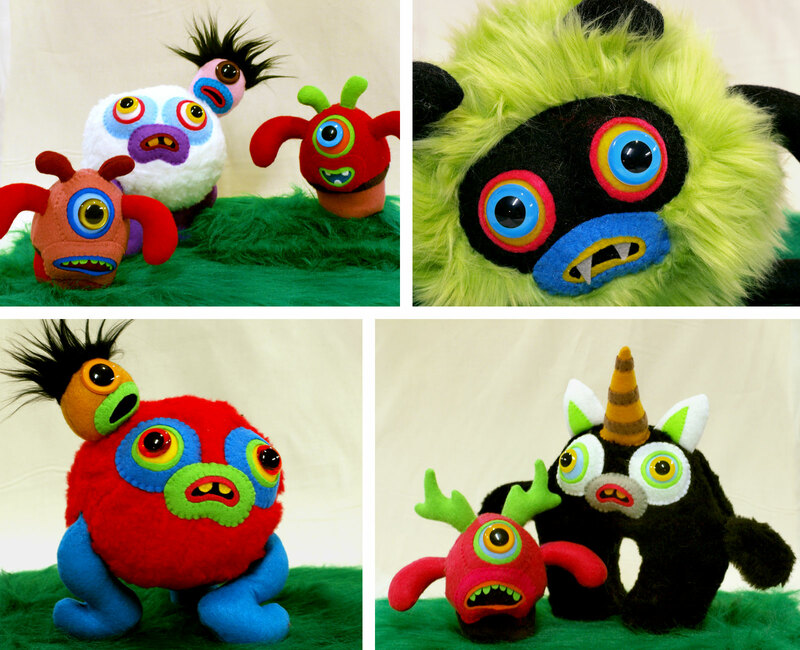 These handcrafted cuties will be for sale through the end of July. Each unique Horndribble monster possesses its own monster personality. I love their little faces! Hooray for fuzzy plush Horndribbles!